Andrea Radrizzani at Elland Road. Andrea Radrizzani, the Italian businessman linked with a takeover of Leeds United, has finally confirmed his intention to buy into the Elland Road club. Radrizzani clarified months of speculation last night by telling The Straits Times, a newspaper in Singapore, that he was negotiating the purchase of a 50 per stake from owner Massimo Cellino, a deal which would give the pair joint control of Leeds. Andrea Radrizzani, back row second from the right, pictured at Leeds’ 2-0 defeat to Newcastle United. The 42-year-old, who has attended a number of United’s fixtures including a recent 2-0 defeat to Newcastle United at Elland Road, said negotiations had been ongoing for six months and were at an advanced stage. According to The Straits Times, Radrizzani - one of the founders of global media firm MP & Silva - plans to invest in Leeds through Aser, a separate media firm established by him. 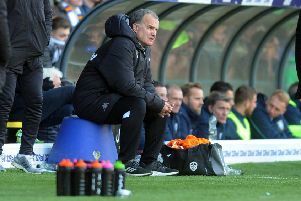 Andre Tegner, Aser’s head of investments and strategy, was photographed with him at Elland Road during the defeat to Newcastle on November 20. Despite his links to technology firm Baofeng, Radrizzani revealed that Chinese funding was not behind his proposed purchase of shares in United. “This deal does not involve any Chinese parties at all,” he said. Rumours of a deal involving Radrizzani have been rife ever since the businessman was pictured with Cellino at a pre-season clash with Atalanta and United’s first game of the season away at Queens Park Rangers. Radrizzani said in August that he and Cellino had entered into a “simple conversation” about investment but confirmation of his plans last night are a firm indication that Radrizzani believes an agreement is close. The Football League, which would have to approve his 50 per cent purchase and subject Radrizzani to its Owners and Directors Test, is yet to be asked to sanction any sale. Cellino has controlled Leeds since completing his own 75 per cent takeover in April 2014. Earlier this year the Italian secured a 100 per cent stake by acquiring all remaining shares from the club’s former owner, Gulf FInance House. Cellino has made no comment about his discussions with Radrizzani and has remained in the background at Elland Road throughout this season. He and Leeds have been approached for a response to Radrizzani’s comments. The Straits Times said Radrizzani had declined to discuss the position of head coach Garry Monk or plans for future investment in players.